LIGHT is appearing at the end of a sales tunnel for the Fiat Chrysler Group. Some of the strongest sales figures produced Down Under have occurred in 2012 and the momentum is building. Playing a large role in that success is the Grand Cherokee. Since its launch in 2011 sales have more than doubled. 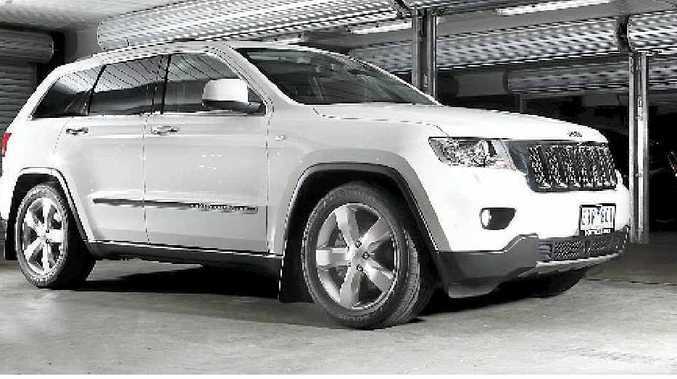 The Grand Cherokee's success is due to strong off-road underpinnings, impressive features and a luxurious ride. Part of that success is due to the shared underpinnings the big SUV has with the Mercedes-Benz M-Class. Most recently Jeep added a honking SRT8 version to its ranks, but we tested the Grand Cherokee one rung down - powered by a 5.7-litre V8 engine. Grip the steering wheel and it provides an immediate feel of the vehicle you're piloting. Thick and burly, it delivers a feeling of control as you sit perched above the traffic. Our Overland derivative boasted the best of what's on offer and the leather trimmed dash and seats offset with real woodgrain features provided a touch of class. Apart from some use of hard plastics at the base of the dash and console, its finishes were up there with some far more expensive Europeans offerings. There's a panoramic sunroof which stretches into the back, push button start and also and automatic tailgate to sweeten the opulent deal. Five adults can find comfortable accommodation inside with the pews supportive in the right spots. The head and leg room is impressive, but expected given the external dimensions. Big brash and smooth, its United States origins quickly come to the fore. With the might of a 5.7-litre Hemi V8 beneath the hulking frame it makes light work of the 2.3-tonnes its pushing. And it can haul nicely, 0-100kmh can be achieved in 8.7 seconds while accompanied by a typically sporting V8 note. Air suspension that can be raised or lowered by about 80mm while on the move gives a silky ride over the harshest of surfaces. On the bitumen that can feel wallowy, especially in corners when it's best to opt for sport mode to avoid feeling every centimetre of its size. While it's adept on the bitumen, the Jeep is not afraid to tackle the beaten track. Unlike some of its rivals the Grand Cherokee has serious off-roader underpinnings. The Quadra-Lift suspension can be controlled via several buttons on the console, and you can scramble up rocks, through mud, sand or snow simply by pressing the appropriate mode. Or you can just leave it in automatic mode, and the electronics do the rest. There are bells and whistles aplenty on this range-topper. Among the standard fruit is real ash wood trim and Nappa leather, Alpine audio system with nine speakers plus subwoofer and 506-watt amplifier, auto wipers and lights, automatic high beams that dip when oncoming traffic is sensed, heated and ventilated front seats and steering wheel, 16.5cm touch screen, GPS navigation, voice command and Uconnect Bluetooth phone system and 20-inch painted aluminium wheels. Safety is about as good as it gets, including multi-stage air bags, ABS brakes with rough road detection, brake assist, blind spot warning system, radar cruise control, traction control, enhanced accident response system and forward collision warning. Those looking for a similar size could consider the VW Touareg V6 TDI 4XMotion ($83,990), Toyota Prado Kakadu petrol ($87,990), but if you want to also match the power there is the Land Rover Discovery V8 ($129,400), Mercedes-Benz ML500 ($119,400) or the Porsche Cayenne S Wagon ($151,900). It's a big V8 moving a heavy skin…and that donk takes some feeding. Its official average is about 14 litres for every 100km, but plenty of city driving will see that figure climb fast. Regular servicing shouldn't be much over $500, but the major tune-up required around 50,000km is forecast to cost about $1500. With good space for five and an impressive allowance in the boot, this is a handy family hauler or perfect for active people who carry various equipment. The back seats have a 60-40 fold and collapse flat into the floor at the pull of a handle. Just like the American market it was built for, the Grand Cherokee is confident and in your face. You can't miss the chrome seven-slot grille on the big SUV which looks like an up-market offering and feels like it inside with a strong list of standard inclusions. Those looking for value in the large SUV segment would struggle to get past Grand Cherokee. It has the ability to go off-road and all the trappings of luxury - in this Overland guise it boasts the features found on some rivals that cost double. Its V8 powerplant is thirsty, so those concerned about consumption would be better served by the turbo-diesel. But for those who want the burly bent eight soundtrack, it's probably worth stumping up an additional $6500 and getting the fire-breathing SRT8 version. Model: Jeep Grand Cherokee Overland. Details: Five-door large luxury four-wheel drive luxury sports utility vehicle. Engine: 5.7-litre petrol HEMI V8 generating maximum power of 259kW @ 5200rpm and peak torque of 520Nm @ 4200. Towing capacity: 3700kg; tongue weight limit 350kg. The good stuff: Equipment and safety levels, internal finishing. What we'd like to see: An electric park brake instead of the foot operated function, better economy. Warranty: Three years, 100,000km. Servicing intervals are set for every 12,000km.